Increase positioning accuracy by reducing play at the pulley tooth gaps. Most linear drives and systems require most precise positioning, not allowing for timing belt backlash. 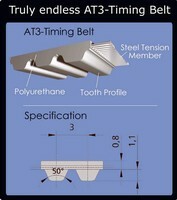 Repeatability tolerances can be improved by "SE" or "0" backlash tooth gap designs. 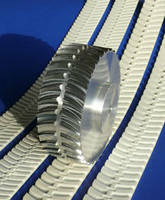 BRECOflex CO., L.L.C., the world leader in polyurethane timing belts offers pulleys "Made in the U.S.A." with Normal Tooth Gap design (most backlash), Reduced Backlash design (reduced backlash - "SE") and Zero Backlash design (eliminated backlash-"0") while maintaining the accuracy of the respective pitch diameter. Besides the "Normal Tooth Gap design", BRECOflex Co., L.L.C. offers, Reduced ("SE") and Zero Backlash ("0") pulleys available in "T" and "AT" tooth configuration. The pulley lead time is eight (8) working days ARO. Please take advantage of our free engineering support! Timing Belt Pulleys feature integral hub locking system. Timing Belts and Pulleys minimize noise and vibration. 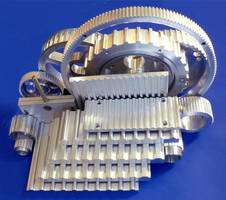 Conveyor Pulleys feature wear-resistant rubber compound.